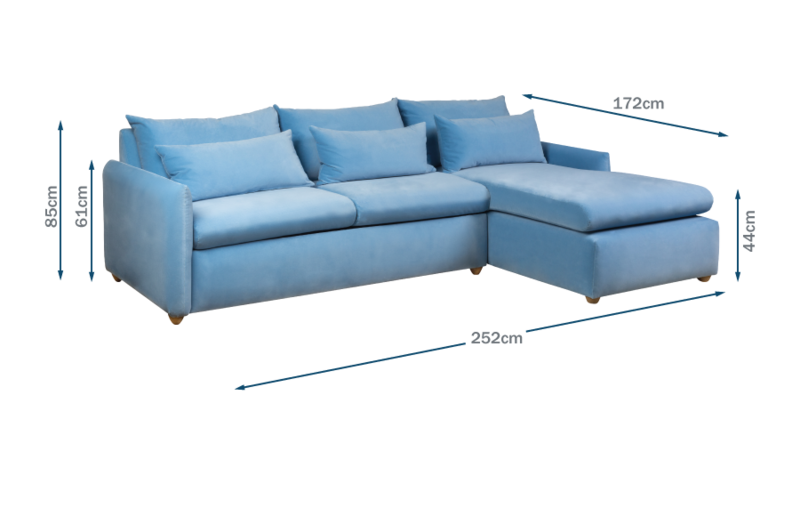 AS SHOWN in Varese Velvet Sky with Natural Feet, alongside the Fawn table range. A hardwearing nubbly tweed weave with a luscious colour palette of yarn structure to give depth and character in bright and deep shades. Composition: 43% Linen, 21% Acrylic, 11% Wool, 11% Polyester, 7% Cotton, 7% Silk. Martindale Rub Count: 40,000. A beautiful blend of materials creating a wonderfully textured fabric that produces a complex, criss-crossing pattern. Composition: 59% Polyester, 22% Cotton, 13% Viscose, 6% Linen. Martindale Rub Count: 20,000. Cool to the touch, Heal's Linen blends soft natural yarns together creating a relaxed yet durable feel. Viscose lends the fabric an elasticity reducing linen's natural tendency to crease. Composition: 70% Linen, 30% Viscose. Martindale Rub Count: 20,000. A luxuriously soft, durable and versatile velvet available in a range of opulent colours. The velvet is water and stain resistant, hard wearing, all whilst maintaining its premium look. Composition: 100% Polyester. Martindale Rub count: 60,000. Yarn dyed textured plains with a special tumbled finish to give a soft handle. Composition: 67% Viscose, 33% Linen. Martindale Rub Count: 30,000. A combination of linen and cotton yarn offers an incredibly hardwearing fabric that has textural interest and character due to the natural ‘slubs’ which occur randomly in the fibres. Composition: 52% Linen, 48% Cotton. Martindale Rub Count: 45,000. Spread the cost from only £174.94 a month with Interest Free Credit. With its clean lines and simple shape, the Pillow Corner Chaise’s versatile design lends itself to any style of home. Its generous feather-filled back cushions encourage you to lie back and relax, whilst the chaise encourages a seating are for all the family. The Pillow range comes in nine different variants and all Heal's fabrics, making it the perfect versatile range for the contemporary living space. The versatile Pillow range is perfect for the contemporary living space, coming in 9 variations to accommodate to your space. Comes with 3 generous feather scatter cushions, adding even more comfort to the sofa. Made by master craftsmen in Long Eaton UK. Rounded feet available in three colour options, to best suit your contemporary space. Sumptuously soft scatter cushions create lumbar support with a soft and feathery feel. Pillow edge detailing creates a simple and modern silhouette for this comfortable sofa. Solid hardwood timber, dowelled glued and screwed. Please Note: Whilst the images displayed here are accurate, they are designed to act as a guide. Differences in seams and texture may vary slightly on the finished item.